Interested in movies about the Korean War, or war movies made in Korea? You’re in luck! With this list of the Best Korean War Movies, we cover both these categories, which admittedly have a big overlap. South Korea’s film industry has produced many high quality war films over the past two decades. Most of these movies address the Korean War (and ongoing tensions with North Korea), as it is most prominent in the country’s national consciousness. However, Koreans also fought in World War II and the Vietnam War. This means there’s also Korean war movies about those conflicts as well. 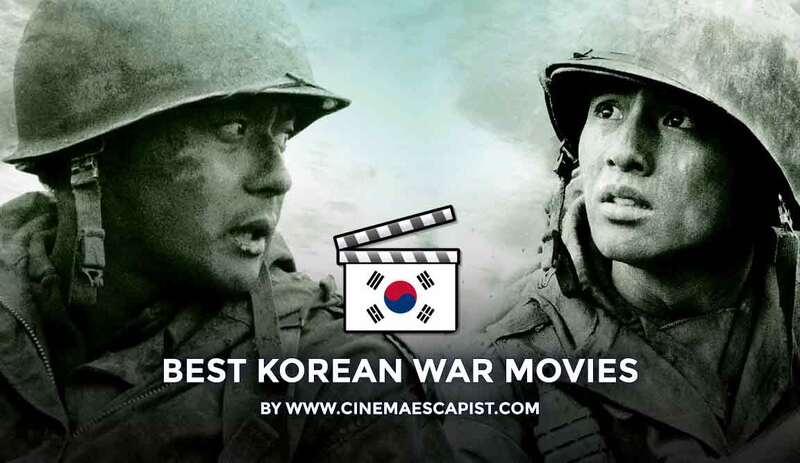 In this list, we explore the top war movies produced in South Korea, as well as a bonus addition from North Korea (which also makes a fair number of war films). This selection covers not only the Korean War, but also other conflicts. 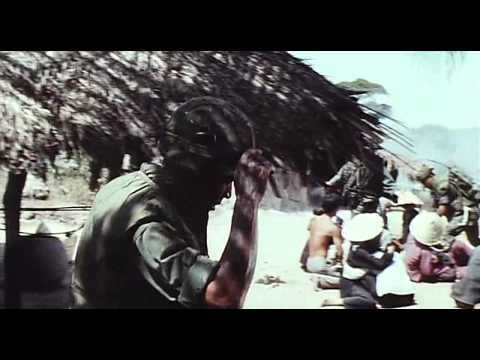 While most movies on this list contain extensive combat footage, we’ve also included some that highlight war’s more human aspects. A blend of espionage thriller and war film, Steel Rain tells the (fictional) story of a North Korean spy (played by Jung Woo-sung) who teams up with a South Korean bureaucrat to prevent nuclear war on the Korean Peninsula. The movie starts with a coup in North Korea. A belligerent cohort of generals seizes power, sparking tensions through a false flag attack and threatening to launch nukes. Our protagonists must combat the conspirators behind the coup and restore more conciliatory leadership to North Korea. While Steel Rain doesn’t have mass infantry battle scenes, it shows off plenty of other military hardware. Without giving too much away: look out for B-1 and B-52 bombers, Aegis destroyers, attack helicopters, and even ICBMs. Furthermore, the movie’s name comes from the “steel rain” ammunition of Multiple Launch Rocket Systems that US forces deploy on the Korean peninsula. Amidst the World Cup in June 2002 (co-hosted between South Korea and Japan), South and North Korea fought the Second Battle of Yeonpyeong. Northern Limit Line tells the story of this intense seaborne engagement. During the battle, North Korean patrol boats fired upon South Korean ones, sparking a deadly back-and-forth that wounded and killed dozens on each side. Don’t let the lack of larger surface vessels deter you: Northern Limit Line offers one of the grittiest depictions of close quarters naval combat ever depicted on film. You’ll also gain a new respect for sailors in the Republic of Korea Navy, whose courage and comradeship the movie puts front and center. Many in the West aren’t aware that South Korea sent 300,000+ troops to fight in the Vietnam War, the second-largest foreign contribution to the conflict after the US. At the time, military dictator Park Chung-hee ruled South Korea, and used these Vietnam deployments to curry favor with the US. Thus, like the US, South Korea has a polarized memory of the war—in which many liberals see involvement in Vietnam as shameful and traumatic. Released not long after the country democratized, White Badge is one of South Korea’s most renowned Vietnam War movies. Based on an autobiographical novel by a South Korean Vietnam veteran named Ahn Jung-hyo, the film explores Vietnam through intense battlefield flashbacks, while periodically revisiting how the war’s traumas remain to the present day. Another excellent Korean movie about the Vietnam War is Sunny, which depicts the conflict from a very different perspective. Korean actress Soo Ae plays protagonist Soon-yi, a Korean woman who goes to Vietnam as a singer in order to find her husband. When in Vietnam, Soon-yi takes on the stage name “Sunny” — giving the film its name. This renaming is also one example of how Sunny explores the Vietnam War’s role in South Korea’s modernization and cultural memory. Sunny offers not only rich insights into Korean history and culture, but also ample combat scenes. To find her husband, Soon-yi sings at the front lines, experiencing artillery bombardments, firefights with the Vietcong, and even a stint in VC tunnels. As we separately explore with an in-depth review, Ode to My Father is like a Korean version of America’s Forrest Gump; it shows how an everyman makes his way through a country’s recent history. Therefore, while parts of the movie aren’t in wartime, many significant scenes are (like how Forrest Gump serves in Vietnam and meets Lieutenant Dan). Specifically, Ode to My Father depicts not only the Vietnam War, but also the Korean War. The film’s protagonist flees from North Korean forces during the Hungnam Evacuation, and then experiences swamp conflict and urban bombings in Vietnam. If you’re a history buff in addition to war movie buff, you need to watch Ode to My Father. During D-Day, American paratroopers captured a man of Asian descent wearing a German Wehrmacht uniform. This man was Yang Kyoungjong—a Korean who had the misfortune of being conscripted into the Japanese, Soviet, and then German militaries during World War II. My Way is a Korean movie loosely inspired by Yang’s true story. 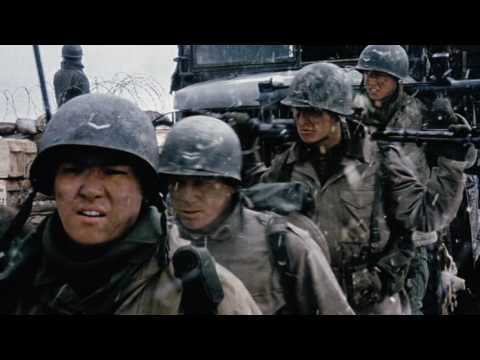 The film’s protagonist Kim Jun-shik gets forced into the Imperial Japanese Army, captured by the Soviets at the Battle of Khalkyn Gol, conscripted to fight the Germans, captured on the Eastern Front, and finally pressed into the Wehrmacht in time for D-Day. 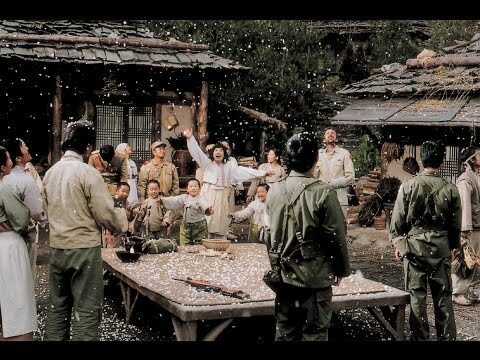 While My Way‘s plot gets disorganized at times, it’s one of the most ambitious Korean war movies ever made and contains diverse combat scenes across many of WWII’s different fronts. To spice up this list, we’ve added Wolmido—one of North Korea’s most popular war movies. This 1982 feature tells a story from the other side of the September 1950 Battle of Incheon, in which Douglas MacArthur led 40,000 troops in an amphibious landing. Wolmido takes its name from an island off Incheon’s coast. 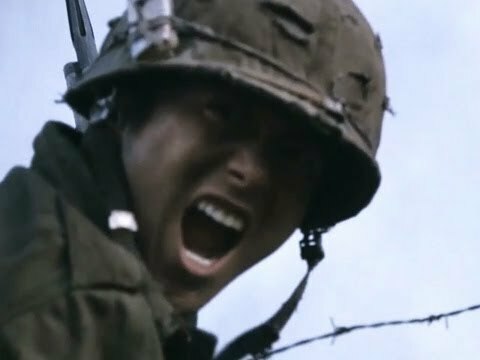 In this action-packed movie, a North Korean coastal battery unit must defend the island at all costs from American attack. While sometimes overdramatized and filled with propagandistic flair, Wolmido provides valuable insight into North Korean attitudes towards the Korean War. Furthermore, you can watch the entire movie for free (with English subs) on YouTube — see above. See embedded video above for full stream. 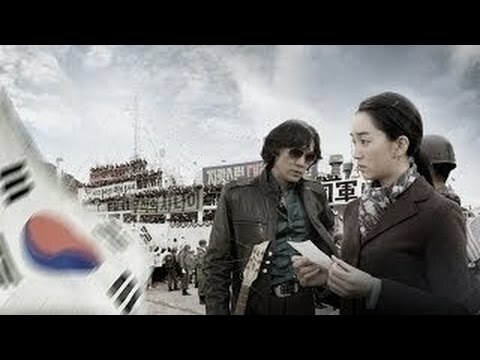 South Korea also made a movie about the Battle of Incheon. Named after the amphibious landing’s codename, Operation Chromite focuses on a small intelligence unit tasked with covertly scouting the landing area. Loosely inspired by the real-life Operation Trudy Jackson, Operation Chromite‘s South Korean protagonists disguise themselves as North Korean troops in order to obtain important intelligence like naval mine placement maps. Without spoiling too much, the plan runs into difficulties and results in aggressive urban and beach combat (including with armored vehicles). As an added bonus: Liam Neeson plays General Douglas MacArthur, who is counting on the unit’s intelligence to execute his landings. A Little Pond delves into one of the Korean War’s most inglorious moments: the No Gun Ri Massacre. In July 1950 (before the Incheon landings), American forces fired upon a group of South Korean refugees suspected of harboring North Korean infiltrators, killing hundreds. The incident stayed unknown until 1999, when a group of Associated Press journalists published a report based on the testimony of both survivors and US troops. Their reportage ended up winning a Pulitzer Prize and was adapted into a book called The Bridge at No Gun Ri. Knowledge of the incident sparked anti-American sentiment in South Korea, even after President Bill Clinton expressed remorse. In A Little Pond, an ensemble cast of South Korean actors plays characters inspired by those who died during the No Gun Ri Massacre. While this isn’t your traditional war movie, it’s a rare, important look at a controversial moment in the Korean War. While war has combat, it also has camaraderie. Sometimes, as certain Korean war films show, this camaraderie exists even between enemies. 2015’s The Long Way Home is one of these movies. 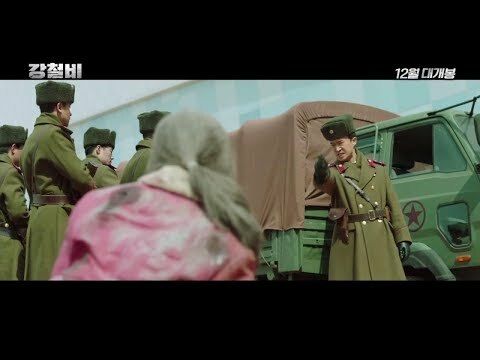 This comedic war movie pits middle-aged South Korean conscript Jang Nam-bok against teenage North Korean soldier Kim Young-kwang. Jang’s commanders order him to deliver an important classified document. However, during an intense battle, Jang loses the document… which falls into Kim’s hands. The two bump into each other, and strike up an unlikely friendship while still competing for the document. Comedy, romance, and combat — In Love and War provides a more lighthearted take on the Korean War. In this movie, North Korean troops enter a remote South Korean village in June 1950. To survive, the villagers give the troops a very hospitable welcome. Meanwhile, the North Korean commander has a secret agenda: to find a Southern girl he knew before the war. Amidst potential romance and the villagers’ bumbling hijinks, the Korean War rages on — and threatens to encroach upon their idyllic life. Also set in an idyllic village, Welcome to Dongmakgol is probably the most popular civilian-focused Korean War film of all time. While there’s still some important combat scenes, the movie offers a more hopeful look at how universal humanity transcends wartime divisions. In the film, a US Navy pilot, South Korean soldiers, and North Korean soldiers chance upon a mountain village named Dongmakgol. The village is so remote that its residents don’t know there’s a war going on. In fact, they’re completely mystified at why uniformed men are pointing wooden sticks (guns) at each other. Eventually, the recent military arrivals come to appreciate Dongmakgol’s innocence—and must cooperate to save it from potential destruction. 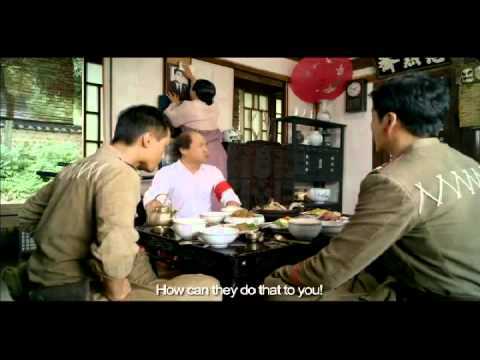 Welcome to Dongmakgol is an all-around enjoyable movie that you can watch repeatedly. It has comedic relief, dramatic tension, and an exceptionally touching storyline. Furthermore, famed Japanese composer Joe Hisaishi (who worked on Studio Ghibli hits like Spirited Away) composed the film’s soundtrack. Based on true events, 71: Into the Fire tells the story of 71 student soldiers who fought hundreds of elite North Korean troops in the Korean War’s early days. In August 1950, South Korean troops remained trapped in the Busan Perimeter. To maintain the perimeter, South Korean and US forces engaged North Korean forces in the Battle of P’ohang-dong. As part of this battle, the student soldiers 71: Into the Fire commemorates fought off North Korea’s feared 766th Unit at a Pohang middle school. Starring famed K-pop singer T.O.P. as a protagonist, the film includes ample, well-choreographed combat scenes. The student soldiers defended the middle school as if it were the Alamo — suffering many casualties and braving intense enemy firepower. 71: Into the Fire doesn’t hold back on depicting the intense sacrifice of those student soldiers. With The Front Line, we move to the Korean War’s closing days. As armistice negotiations drag on in 1953, North and South Korean forces jockey to control strategic hills along the 38th Parallel. Amidst this back-and-forth, a South Korean officer is sent to the front line to investigate a suspected Northern spy infiltration. There, he finds more than he bargained for. Through sweeping human wave charges, suspenseful sniper battles, and intense trench warfare, The Front Line depicts war as senseless and brutal. However, the movie doesn’t have any ideological bent: it simply focuses on the soldiers themselves. In The Front Line, both North and South Korean soldiers openly wonder why they’re fighting, yet keep doing so because war has become their default way of life. Last but not least, we have Taegukgi— the most renowned Korean military film ever. The film’s subtitle “Brotherhood of War” comes from its plot about two brothers who fight on opposite sides of the Korean War. Taegukgi has truly epic scale. The movie’s plot starts in 1950, goes through 1953, and even includes a flashback from 2003. It covers a range of battles — from urban warfare in Pyongyang, to fighting in hills along the 38th parallel. There’s top-notch cinematography, special effects, and acting to top it off. Besides sweeping combat scenes, Taegukgi also holds societal significance. The Korean War separated many families, and it wasn’t uncommon for brothers to serve on different sides (there’s even a statue about it). Therefore, Taegukgi had great emotional resonance in South Korea, poignantly reminding people of the lasting trauma of division. The film also marked South Korean cinema’s increasing maturation. Taegukgi was South Korea’s first modern, big-budget movie about the Korean War. Its critical and commercial success helped pave the way for many of the other movies you see on this list. Want more war movies? 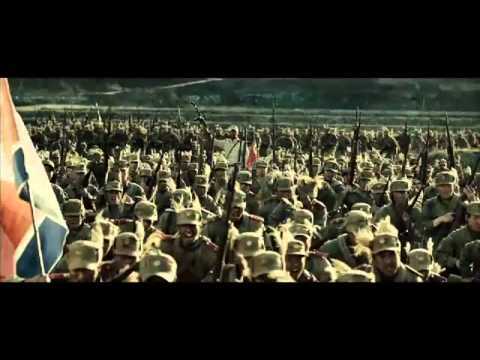 Check out our list of the Best Chinese War Movies!